What does Arizona Foundation Solutions do? We investigate, stabilize and raise foundations. We restore and lower (level) foundations that have heaved. We also repair cracks, as well as repairs for concrete with corroded rebar. You can usually tell by large drywall cracks, slopes in the floor and doors and windows out of alignment. If you see these warning signs, call now for an expert evaluation by a trusted foundation repair specialist. What kind of solutions does Arizona Foundation Solutions provide? Depending on the cause of your foundation problem, we alter our solution. We use helical piles, micro piles, hydraulically driven piles, compaction grouting, and carbon fiber strengthening among many other unique tools. See services tab. Why does Arizona Foundation Solutions offer more than one type of solution? We strongly believe in being objective and offering the best solution for your unique situation. If the only tool you have is a hammer, then all solutions start looking like nails. We want to be able to pick from one of many excellent tools, depending on the problem. How does Urethane Foam injection help? Urethane foams make great waterproofing products and are used widely for mud jacking. Some manufacturers claim that this type of product can be used for deep soil stabilization. No industry accepted evidence has been produced to support this claim. Contrary to some contractors claims, it is not a good product for foundation stabilization. Can I postpone repairs and house leveling? Yes you can. However the sooner the repairs are completed, the better track record you can demonstrate to eventual buyers. Sometimes, conditions can worsen causing damage in greater proportion to time that has elapsed. What causes foundations to heave? Heaving is caused by hard compact clays as they expand from water. Think of a dry sponge as it gets wet. In Tucson, AZ, heaving foundations are commonly misdiagnosed as settlement. What causes foundations to settle? Foundations settle either from clay soil shrinking from lack of water, or from soils that are saturated enough to cause consolidation or collapse. Many times it is the weight of the soil on top of itself rather that just the house weight that causes the problem. What is a level B foundation inspection? This one of three levels (AB&C) as defined by the Foundation Performance Association. A level B Inspection basically includes, an interview with the homeowner, a damage assessment survey, and a floor elevation survey. The results are then analyzed rated per PVA consensus ratings and summarized in a report. Water is usually the catalyst of changes in soil conditions. Since it can cause settlement or heave, it is important to maintain consistent moisture levels. Here in Arizona that usually means, keeping it dry. How does a plumbing leak affect the foundation? Plumbing leaks can introduce water, similar to poor grading and drainage as noted above. Each case is different. Usually the conditions worsen over time. At some point a sale of the property will be contemplated. If it is sold in un-repaired condition, the fear of the unknown will demand a larger discount than the actual costs to repair. At some point the damage could cause instability in the roof trusses. Doors and windows could eventually become inoperable. The average cost is between $8,000 to $15,000, however the costs can vary greatly depending on each individual situation. What if there are voids under my slab caused by a leak? Please contact Encompass Inspections if you think you may have a leak. Encompass can both locate the leak for you and also help determine the extent of the voids under the concrete. Encompass Inspections can be reached at www.encompassinspections.net. If you're in need of any of our foundation repair services, don't hesitate to contact us to schedule a free inspection or to learn more about our foundation solutions. 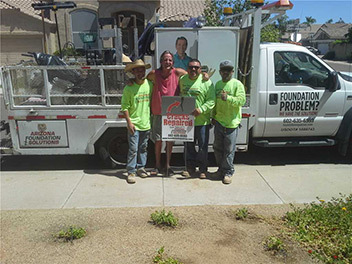 Arizona Foundation Solutions is here to help you return your foundation back to its original state.